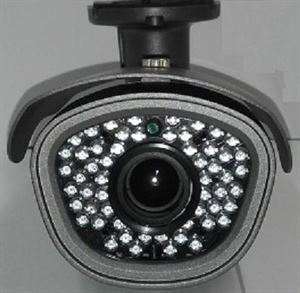 Varifocal CCTV Security Camera with 800 TVL, Color, and Night Vision. 2.8-12mm Lens. This model offers 56IR High Efficiency, High Intensity Smart Infrared LED's. These LED's are superior to standard IR LED that all other sellers install to cut corners. The IR LED use less electricity while still providing a longer a wider spread of light. We install 60 and 80 degree IR LED to provide a deep, wide angle of IR LED spread across the entire picture. The Smart IR LED change intensity as objects move closer to avoid washout that is common with most other brand cameras.